Whizzing around the globe, the Sans Frontières detective agency took the audience on an action packed adventure. It was a race against time through jungles, deserts and ice palaces as they chased their archenemy - the dastardly Fantôme Cycliste. Joining in with the songs and experiencing a wealth of cultures, the audience went on a fun-filled journey featuring original music, interactive video and some simple French. Bon Voyage! The show was suitable for primary school children aged 7-11, their teachers, families and friends. A free education pack was available to teachers and group bookers. 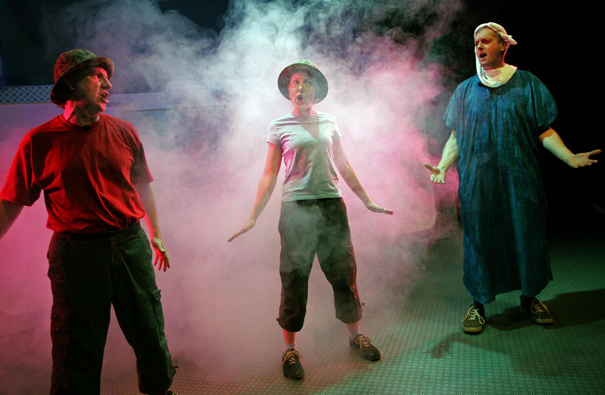 Around the World in 80 Minutes 2005 toured to 16 venues giving 37 performances.